Figure 3. ET rates and precipitation in southwest Nebraska July 13-21. 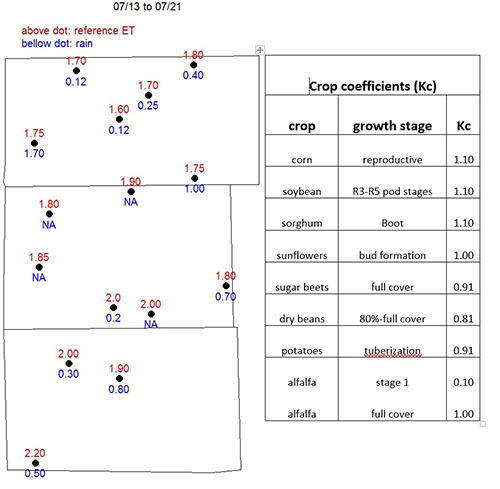 Strahinja Stepanovic, Cropping Systems Extension Educator in southwest Nebraska: Reference evapotranspiration (ET) in the Upper Republican NRD ranged from 1.70 inches in northern parts of Perkins County to 2.20 inches in southern Dundy County. We received between 0 and 1.70 inches of rain in the last week. 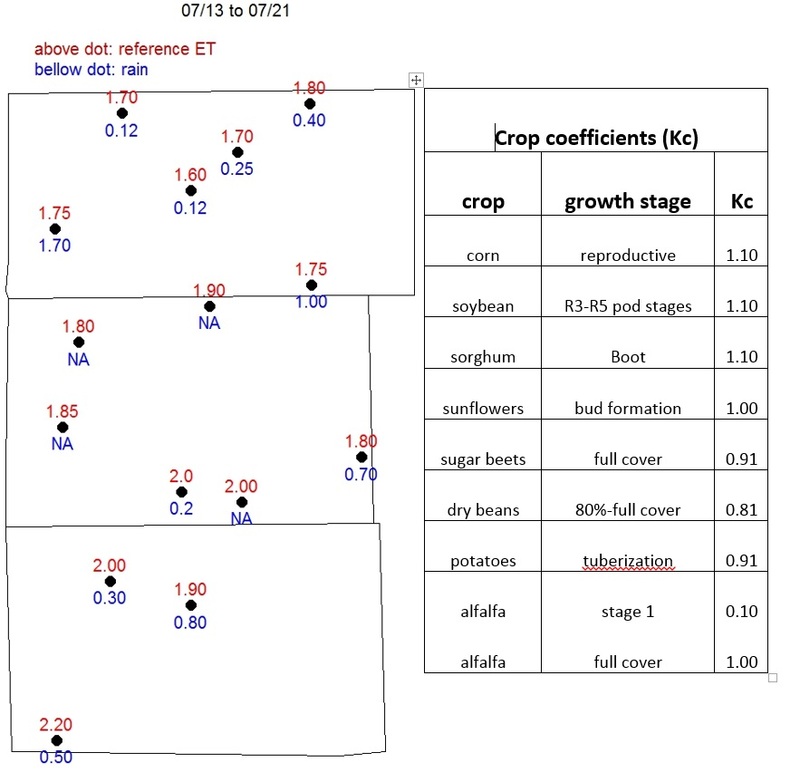 To more accurately estimate rain and crop water use on your farm, look at the map provided, obtain weekly reference ET value from the location closest to you and multiply that value by crop coefficient provided in the table. Carefully identify the weeds present in your field. Spray kochia, Palmer pigweed, pricly lettuce, Russian thistle and other tough-to-control summer annuals with a tank-mix of glyphosate, dicamba, and/or 2,4-D to prevent seed development. 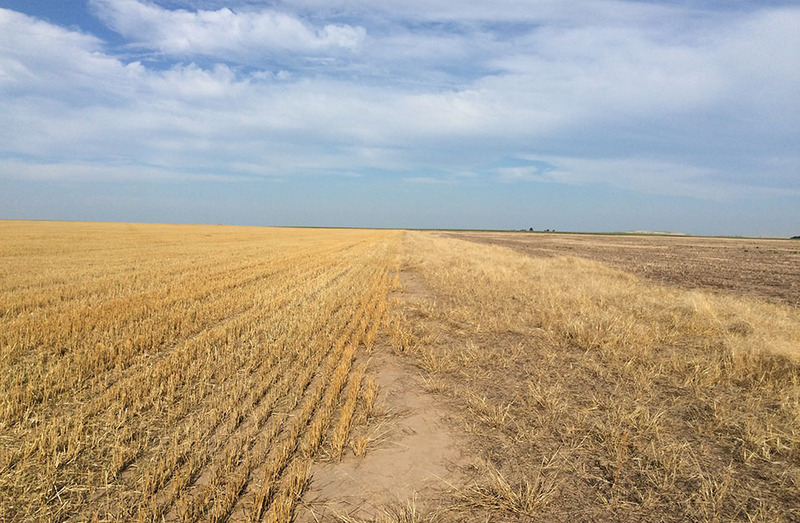 Monitor for winter annual weeds like rye, marestail, and cheatgrass and plan timely herbicide application in fall and early spring. For more information search for recent articles in CropWatch. Corn is at reproductive growth stage. Adults of western bean cutworm have been emerging in the past week and spraying has been done in the area. 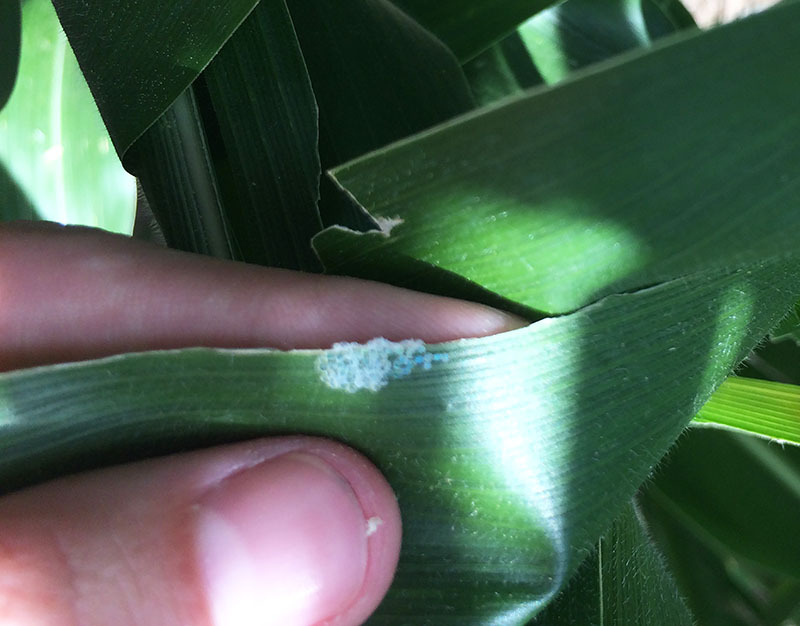 UNL's recommended threshold for insecticide application is when 5-8% of corn plants have egg masses and/or small larvae. Sunflowers are at V5 to butonization stage. Field peas harvest is done. Soybeans are at R2-R4 growth stage (setting pods). Milo is at boot stage. Potatoes are in tuberization stage. Dry beans are at 80%-full cover. Sugarbeets are at full cover. Todd Whitney, Extension Educator in Hamilton County: We got 1-3 inches over the weekend with winds up to 70 mph that cause damaged to outer edges of fields where there was some lodging. Crops look strong here and are still progressing well. Nearby counties have seen southern rust, but as of July 27 we hadn't had any reports.